When Lena (@lena.naeht // unpaid ad - name tag) posted this thrifted outfit on her Instagram I fell in love with her thrifted outfit the minute I saw it. That is why I asked her if she wanted to do a photoshoot with me. The outcome are these amazing photos. 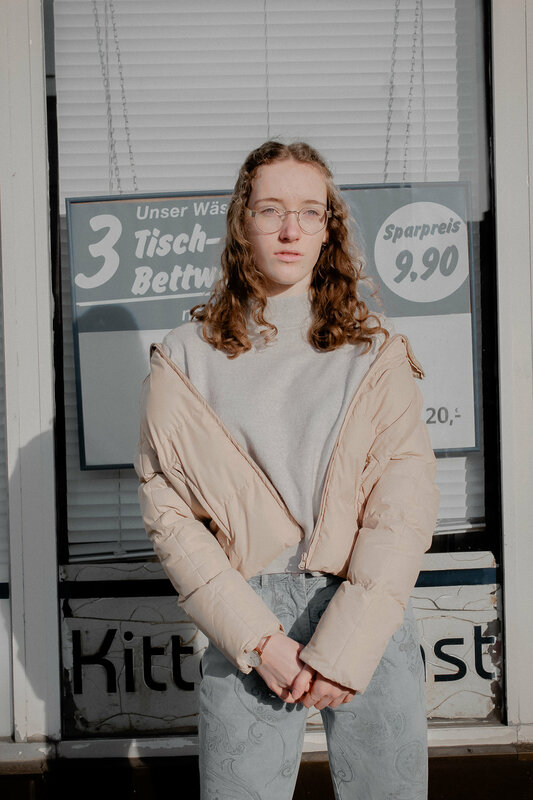 Lena found the jacket and the pants at our local thrift store here in Osnabrück, Germany. When we took these photos it was early in the morning on a sunday. While the sun was straight on her face, it made it quite difficult to look straight into the camera. But Lena powered through like a pro and made it look like the sun didn’t bother her at all. Oh, and since we shot different outfits you will actually find this bouquet in several different groups of photos. Like in these photoshoots: Slow Fashion Style Photoshoot & Romantic Fashion Style.